Volkswagen has revealed stunning photos of the production version vehicle known as the XL1, a capsule-shaped vehicle that will be considered “green”. 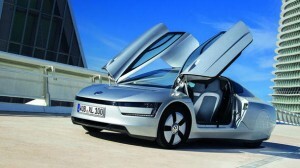 VW declares the XL1 will travel 261 mpg on a gallon of diesel fuel. Volkswagen isn’t doing this the expected environmental way – they are pushing the limits with a car that’s power comes from a two-cylinder, 0.8-liter diesel — essentially half of VW’s standard 1.6-liter four-cylinder diesel plant — mounted in the rear of the XL1, linked to a 7-speed transmission, a 5.5 kWh lithium-ion battery and electric motor. The two-seat body of the XL1 has a 0.189 coefficient of drag (a Toyota Prius has a 0.25 Cd) and it weighs just 1,752 lbs., about half of a typical American midsize sedan. This combination allows the XL1 to travel 31 miles on electricity alone. The body of the XL1 will be made from carbon fiber, although using a process VW claims will be far cheaper than those applied by supercar builders such as Ferrari and Lamborghini. 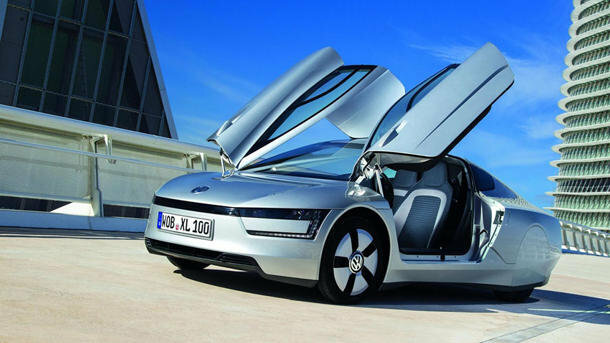 The XL1 will be assembled by hand in a special section of VW’s Osnabrueck factory in Germany. It exists only due to the will of VW Chairman Ferdinand Piech — grandson of Ferdinand Porsche, the designer of the original Beetle — who has pushed VW to refine the idea of the XL1 for more than a decade. For all that VW revealed today, it didn’t announce prices or when it will be available for drivers. To see a gallery of photos click here.